I woke up this morning to an email from good old Simon and Schuster letting me know about this new gadget thing they have called a Vook. Ok...I get it...V as in video...ook as in book=Vook. This is the next stage in digital books, and I think this is going to be pretty big. But of course, first thing in the morning, I'm thinking... vooks, vooks, vooks? BUTTER BATTLE BOOK! Zooks and Yooks! Anyway the deal is that now when you are reading a book digitally, with a vook you can also watch little videos to go along with it. My initial reaction to this is...I don't like it! But in some respects...I can see that this is cool. For non-fiction how to books, that makes a lot of sense. As a writer, book lover and a dancer, you can guess that I have a shelf of books entirely devoted to dancing and movement. But I'll tell you...the portions of those books that explain how to do a dance-never ever work! Even when they break a move down with 12 pictures...there's really no better way to teach a dance or to learn one than by actually seeing it done. Now if we are looking at the history of dance, or we are discussing established movements or types of dance within a genre, theory, famous dancers, etc...those books are cool. But yeah...having a little video pop up during the instructional portion of the text would be helpful. So for non-fiction...ok...I see where you're coming from, I can step on board. 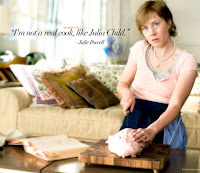 Although anyone who recently saw Julie and Julia may or may not disagree. Cooking...kind of complicated, we need lots of instructions, we need pictures, but we've been managing with cooking books for a long time. Julie did it-she made every single one of Julia Child's recipes using her book. But then there was the tv show...how helpful would it have been when she had to debone that duck for her book to suddenly switch into video right in that moment demonstrating proper duck de-boning? But fiction... here is where I start to feel more uncomfortable with video being mixed in to writing. I mean, I love how books have expanded recently to having their own trailers (book trailers rock) and how many of us writers now put together playlists to accompany our books, and we blog (sometimes we let our characters blog), and we post pictures, and our books (when we're lucky) get made into movies. But those are all supplementary to the written word. From The New York Times article "Curling Up With Hybrid Books, Videos Included," we are given this example of a major plot point being revealed in a book, not through the text of the author, but by switching to a news video. A romance author spoke about including videos of atmospheric scenery that related to the setting of her book. That's cool and all...but as writers, aren't we supposed to take you there with our words? Don't we spend hours and hours, years and years and draft upon draft trying to take you there, make you see it, make you feel it? We write so you can see the trees, smell the pine in the air, taste the chocolate pudding on the table. Well at least video can't do those things either, but you get my point. We are trying to invoke things in the reader with words. And movies invoke similar thoughts and feelings but with pictures. What about using our imaginations to see things the way we want to in our heads and the creative part of the writing process readers engage in? Now if we're talking Da Vinci Code, where they soon released the art version of the book, yeah...being able to see all of those paintings when they were mentioned would have be supremely helpful. 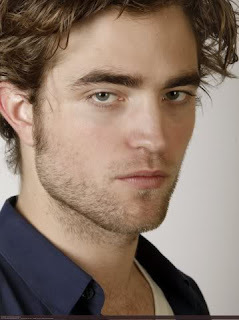 But remember back when Twilight was first casting and Robert Pattinson wasn't RPatz yet but just this grungy looking guy left over from Harry Potter and the Goblet of Fire? Everyone hated him! He wasn't attractive enough to be Edward, he didn't have the right look for Edward. Now he IS Edward, and as much as I think Rob's a cool guy, I kind of miss my old Edward, the one who lived in my head and was way way hotter. Movies do take some of our own images away. But at least those images have the chance to grow and exist and be. What happens when videos come with books and we are overwhelmed with images that aren't our own? 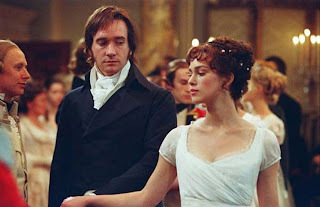 There is something kind of tantalizing about opening up a copy of Pride and Prejudice and getting to the ball and having the text dissolve before your eyes while you hear regency music start up and see ladies in beautiful dresses swirling before you while Lizzie and Mr. Darcy face off. I think Jane Austen already did that for us with her pen. I agree we take the creativity from the reader by imposing images. I think books should remain books but know this is probably old-fashioned and naive. Books will change. The importance of story won't. I just hope reading will not become a passive activity where the reader is not engaged/making choices, drawing conclusions on their own. I don't know, I kind of love it. As with anything, I think if done well they'd be amazing, if the quality is poor, they'll be a joke. I'd rather keep my books and my movies separate. I will always think of books as text (of some sort) and movies as, well, moving pictures! Yeah its a tough one. Lila I knew you'd be all for this! I mean like I said, you get to the ball and bam! You see it. Or how cool would it be for you to be reading my book and zomg-my playlist plays in the background at the appropriate time. It worries me. But then again, I'm from an older generation than y'all. I mean, yeah, I can see the coolness of it with something helpful like a dance video, but with fiction, I prefer to use my imagination. That said, I do think we all need to realize that publishing as we know it is changing. And changing rapidly. That can be exciting, as well as frightening.